A PeakPoint client since 1997 till 2012, Viisage Technology Inc. (now MorphoTrust) is a leading provider of secure digital identification systems, and the global leader in facial recognition technology. The company's proprietary technology is widely used throughout the world today, and is poised for substantial growth amidst concerns about homeland security, secure identification and corporate security. "It is my pleasure to enthusiastically recommend PeakPoint as your technology partner. They consistently demonstrated the ability to provide excellent technology solutions, while always responsive to our tight time schedules and budget constraints. Mr. Kumar and his team are the most dedicated, professional, competent and customer-driven team I have worked with in my more than 25 years in high technology industry. 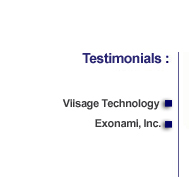 I have every confidence that they will contribute to your company's and your customer's success as they have done for Viisage and its customers." "As CTO of Emplanet, Inc, I used the services of PeakPoint Technologies, Inc.
What an outstanding group of people! They were flexible, hard working and always there for us. With their help, we created some great middleware to access our legacy record keeping system. The system came in under budget and performed flawlessly. Saro Saravanan, President and Founder, Exonami, Inc.